This Ateco 5757 9-piece plain round cutter set allows you to make fun goodies that your customers will love! It is ideal for cutting pastry dough, fondant, and gum paste with consistent, reliable results. The transparent blue coloring enables users to see where they're cutting more easily, which is particularly helpful when positioning close cuts. This enhanced visibility minimizes waste for a higher yield and ultimately more money in your pocket. Plus, thanks to each cutter's round top ledge, users can safely and comfortably press down on the cutter without hurting their hands. Such a great set for so many uses!! Love the way they come nested in the plastic container. These are very high quality and easy to use! Made sugar cookies with them but can imagine so many other uses! I use these for clay in my pottery studio, and I love that I have almost any size square I need! They are sturdy and a much better price than the ones I found specifically for clay. SImple, easy to use, we use these fairly often and I did not think we would use all the sizes but we do. Great for cookies, biscuits, galettes! A simple round cutter always comes in handy for cookie projects and having a variety of sizes is the best. Ateco polycarbonate cookie cutter sets are so great because they are inexpensive, useful and cut cookie dough really well. I love this round cutter set. I use it for soap making and it is nice to have a plastic option instead of metal. They are so easy to clean! Useful little cutters. The didn't cut as well I would have hoped for the application we used them for but got the job done with a little extra effort. Its nice having the option of different sizes but we only ended up using a couple of them. Some of them i don't know if we will ever use. I really like this set of cutters. Well made, durable and a good range of sizes. I do wish that there was a 10th part of this set, on occasion I have wanted one just a bit bigger! These cutters are not completely straight on the sides, they taper out just a little halfway up - so if you are using them to cut anything higher out, it won't be completely straight on the sides. A good biscuit cutter set is suddenly very hard to find. I was very relieved to see this website stocks one that is of such high quality. I was a bit skeptical, due to my recent failure to find a decent one in person at restaurant supply stores, but was blown away by this product. I make a lot of items that require different sizes of biscuit cutters such as tarts, cookies, etc and this set has every size you could ever need to fit in any size pan. I have already recommended this product to other people in the industry. This round cutter set does a great job of cutting pastry and biscuits, etc. I like that it comes in a storage container to help keep all 9 organized. My only complaint is that the sizes are not on the cutters (or even the container) at all. These cutters are pretty good for the price. Since they are plastic, the cutting edge is not very sharp, so they don't work as well with certain items that require more precision. This is a dream cutter. It works really great. It cut perfect rounds without residue. It is more than I bargained for at a really great price. Good little round cutter set - it comes with a large number of circles and they all fit together snugly in the case. Dishwasher safe - for the price, good to have on hand instead of needing to look for a canning jar lid at the last minute. I have used other cutters in the past, but no matter what, when you clean them, ended up with rusty corners and edges. These plastic alternative is great and easy to clean, I even put them in the dishwasher sometimes. These cutters are the best, i have the option of choosing from 9 different sizes. I do not have to worry about rusting since these are hard plastic. They were dropped a couples and no scratches very sturdy and no regret purchasing theses. This is a nice, sturdy plastic round cutter set. I love that it comes with so many different sizes, so that you can find just the right size for whatever you are making. Great little cutters for the price. The cut could be a little sharper, but the value is there, and I won several sets. I use them often! 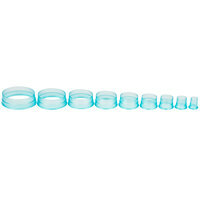 I LOVE THIS ATECO 9 PIECE POLYCARBONATE PLAIN ROUND CUTTER SET...SO MANY CHOICES FOR SIZES AND USES...LOVE THE EASE IN CUTTING..THEY ARE BUILT STRONG AND COME IN A MATCHING CASE FOR SAFE STORAGE...WASH UP EASY AND WERE A GREAT VALUE. We use these cutters to shape all sorts of veggie burgers, they work great. In addition to being low-cost, we noticed the polycarbonate material is better suited to veggie burgers as it doesn't stick to the burger as much as many of the steel cutters on currently on the market. We also plan to use this for baking and potato cakes. Very versatile instrument. These cutters are great for both cookie dough and pie dough! They fit inside of one another nicely, making them super easy to store. I love the many different sizes that come with the set; perfect for all of your round cutting needs! And they clean up easy too! I like this set very much. All the cutters nest together in a storage container which helps with shelf space plus keeping them all together. Keep them in a high cupboard and my grand daughters thought they were perfect for tracing circles for their pictures! Have used Ateco items for many years. These are well made and well priced. Gets these well made unit and they will last a while . Love all my Ateco products and I'm sold on the brand. Sturdy and EASY to clean-just toss them in the dishwasher. I usually rinse, throw them in the dishwasher basket and run the cycle. When you take them out they are clean and sanitized-back straight into the handy case. I just store them in a drawer. For the price, buy it, buy them all! If you're like me, there's always the one you don't have and really need to acheive perfection, if you buy the sets you will have them all! This has a lot of great different sizes that are good to use they are great, a little harder to take out and put back in just because of how close in size they are at the top however it's not that hard to take them out and put them back in if you take them all out at the same time. I highly recommend using these and recommend them to anybody who needs round cutters and affordable price! These cutters are strong and durable. They make a very clean cut. I like that is made of polycarbonate and will not rust. I’m buying more shapes now! I have many of the Ateco Cutter sets and I love them all. The round one is my favorite, and I use it the most. Its perfect for cutting out cookies or even fondant/gumpaste for my cakes. This round cutter set is great and we use it for everything from fondant to gum paste and cut out cookies. The pieces are high quality. Really nice cutters, easy to clean, sturdy, and the color is nice. I have had metal ones bend and get ruined trying to store them. having them all store in one small container is very nice. Easy to clean and light weight to carry. I use this product every day and if your like me then other people like to use your stuff. No worries here. These are a must. I've had a lot of fun playing with these! Nice for biscuits, cookies, even donuts; choose three graduated sizes and make cute mini-wedding cakes for a bridal shower! These Polycarbonate Cutter and strong and durable...I have been using them for over and year and have been very pleased with the consistent results I've received...very happy! I love this cutter set! Have used it for cookies as well as cakes and they cut perfectly every time! Feel strong and well made. Easy to store in it's own container.. These have become my new favorite cutter sets. These work great. I mainly use them to cut out fondant polka dots, but they are great for biscuits or cookies too. They are even sharp enough to cut cake for individual portions. I use these cutters to cut out different size circles for my fondant cakes. It's easy to use and easy to clean. The circles come out perfect considering it is made out of plastic. Perfect for the number of cookies sizes we offer. Also great for mini cakes. I love that they are sturdy and won't rust. I will be ordering other shapes. A great set of round cutters. Never have to worry about them bending or rusting. The cutters are nice and sturdy and cut cleanly with no jagged edges. I love the construction of these cutters, they will never bend like stainless steel. They are super easy to clean. The value can't be beat for the quality and quantity of perfect circles in this set. shipping was fast!! i received these today along w/ the 3 other sets i purchased! i looking forward to using them in school and at home!! thanks for the great service!! Excellent sturdy cutters made of tough plastic and the perfect size for cutting fondant round shapes for cakes and cupcakes as well as cookie dough, in different sizes. The storage container is a big plus. I am very satisfied with the quality and variety of sizes this 9-piece set offers. They worked wonderfully for making a variety of cookie and pastry cut-outs for me so far! These probably won't last forever, but I wasn't too sure how much I'll actually need them. These will work for those odd times that I do.